When looking at potential replacements for Kevin Pietersen in England's one-day teams, you first have to consider the possible openers who are already in the team, namely Craig Kieswetter and, at a push, Jonathan Trott. While Trott has been England's most consistent one-day batsmen for a few years now, England's problem has constantly been a failure to make the most of the fielding restrictions in the first 10-15 overs. Admittedly, Kieswetter has had limited success opening for England, but he does the job for Somerset so if he is to be England's one-day 'keeper, he may as well fill the role he is most comfortable with. I've always been a fan of James Taylor, and the Nottinghamshire batsman struck a brilliant century for his county recently in the Clydesdale Bank 40 competition. It was the perfect one-day innings; a cautious start leading into explosive acceleration. Critics have pointed to his average record in the County Championship, but his figures for England Lions are excellent, showing that he could have an eye for the spotlight. He's only played one game for England, a rain-affected ODI against Ireland, and surely deserves more than that. Another possibility is Ben Stokes. The Durham all-rounder has been in good form lately and carries a reputation as a very clean striker of the ball. His bowling, which didn't feature in his appearances for England last year, has improved markedly and can provide Alastair Cook with a very useful option. His games for England all came immediately after his return from a serious injury, so a fully-fit and firing Stokes could be a dangerous proposition. 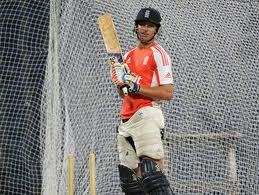 The Somerset 'keeper-batsman Jos Buttler is also a viable choice. He has demonstrated a cool head under pressure and often plays the role of the 'finisher' for his county. His frequent improvisation and quick running between the wickets really puts me in mind of Michael Bevan, and he has a superb List A record to boot (an average of 63.91 and a strike rate of 123.32). No speculation is complete without the wild-cards. The Surrey pair of Rory Hamilton-Brown and Jason Roy have raised more than a few eyebrows with their ultra-aggressive stroke play. Hamilton-Brown has really matured after being made Surrey captain and is always guaranteed to get the innings off to a roaring start. He played the match-winning innings in last year's CB40 final and bowls useful off-spin. Roy is someone who's always worth watching simply because of his sheer bravado. It would be no surprise to see him attempt to hit the first ball of the match for six if the ball is within his range. He was the second-highest run scorer in the CB40 last season, but he does struggle for consistency as he sometimes goes after deliveries which are not there to hit. His selection would show a sense of adventure, something which England's selectors have not leaned towards in the recent past.